Discover what is plaguing Narfi's mind. "You live among the clouds now, dear Reyda!" Return the necklace to Narfi. 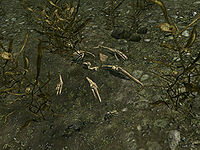 When you visit Narfi in Ivarstead, you will quickly find that all is not well with him. Narfi lives in his parents' broken-down house across the river from the lumber mill. When speaking to him, you will notice that he has a mental disability and is very distraught over the disappearance of his sister, Reyda. He will mention that Wilhelm, the innkeeper at Vilemyr Inn, told him Reyda would come back, and that he needs to say goodbye to his sister like he did his mother and father. When speaking to Wilhelm, he will tell you that Narfi is harmless, but in a state since his sister disappeared. Wilhelm, meaning well, told Narfi his sister would return one day, but actually fears Reyda was killed while searching for ingredients from the river. He will point you in the direction of the small island to the east of Ivarstead, where you can then go look for Narfi's sister. There is a small barrow dungeon on that island, Geirmund's Hall, and it seems like the obvious place to start. Wilhelm's supposition about Reyda's fate turns out to be correct, but his directions are a red herring. Reyda's remains are not at the island, but can be found underwater, just east of the southern bridge into town. They can be difficult to get to, due to the current (and almost impossible in third person view). Next to her remains are her necklace and a satchel; the satchel contains some gold and several random alchemical ingredients. Return the necklace to Narfi. You can tell him the truth about what happened to Reyda, or assure him she will come back. In either case, you will receive three random, rare ingredients, and Narfi will, for the most part, remain the same. Narfi is the victim of the Dark Brotherhood quest Kill Narfi. Once you accept the assassin quest, it will be impossible to complete the Reyda quest successfully. If you show Reyda's necklace to Wilhelm, his reaction is exactly the same as Narfi's: "Reyda! You saw Reyda? Did you tell her Narfi cries? Did you tell her Narfi never said goodbye like mother and father?" If you take the necklace from Reyda's satchel before asking Wilhelm about Narfi, the quest will not update beyond the stage requiring you to find her remains even if you search the satchel again. The command setstage FreeformIvarstead02 40 will do the work. Dropping and retaking the necklace using the console command player.drop 663da 1 while standing over the underwater satchel causes a quest update, fixing the quest. Narfi may quit dialogue without giving you a chance to tell him about Reyda's fate and finish the quest. Going straight to Reyda's corpse after accepting the quest instead of talking to Wilhelm will leave the log entry about asking Wilhelm in your miscellaneous quests tab even after the quest, and Wilhelm will have no topic about Reyda should you visit later. The only way to fix this is by returning the quest to an earlier stage by using the command setstage FreeformIvarstead02 20 and redoing the quest in proper sequence. Reyda's name is frequently misspelled as Rayda in the German translations of Narfi's dialogue. ? On the PC, it is possible to use the console to advance through the quest by entering setstage FreeformIvarstead02 stage, where stage is the number of the stage you wish to complete. It is not possible to un-complete (i.e. go back) quest stages, but it is possible to clear all stages of the quest using resetquest FreeformIvarstead02. This page was last modified on 26 March 2019, at 17:58.